On Wednesday, May 8, join the Thurston County Chamber for the 114th Annual Meeting and the beginning of the Chamber’s 145th year. The program will include a report out and a glimpse at an exciting program of work for 2019/2020. Former U.S. Ambassador Suzan “Suzi” LeVine will deliver the keynote address. One year ago Gov. Jay Inslee appointed LeVine as commissioner of the Employment Security Department. LeVine served as U.S. 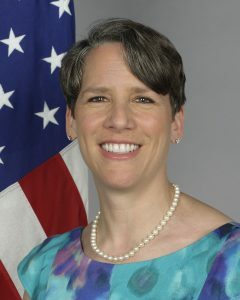 Ambassador to Switzerland and Liechtenstein from 2014 – 2017 at the request of President Barack Obama. She has extensive experience in workforce development, apprenticeships and the future of work. As ambassador, she was instrumental in collaborating with more than 30 companies to expand the Swiss style apprenticeship model into the United States. LeVine served as a member of Inslee’s Career Connect Washington Task Force and as a delegation co-chair of Inslee’s study mission to Switzerland in 2017. Reservations are required for this event. Register at thurstonchamber.com. Thank you to our presenting sponsors, The Port of Olympia and Heritage Bank. WHEN: Wednesday, May 8, 2019 at 11:30 a.m.